That’s right, I got served today… with $250 from American Express! Giveaway Bandit has partnered with American Express and Verizon to announce a new promotion they are offering all new Serve customers. So, what’s Serve? It’s a digital prepaid account from American Express. It’s an alternative to your debit and other prepaid cards that’s loaded with some awesome features and benefits. The best part is there are no credit checks, no monthly fees, and no annual fees. Plus, you can use the prepaid card online and in stores everywhere American Express Cards are accepted in the US. You can instantly send and receive money by email, text, and Facebook. Sounds like a great way to send money to your kids if they are off to college. 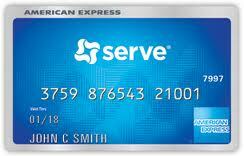 Sign up for an American Express Serve Card today! New Serve customers will receive a $25 account credit via Serve upon signing up for an account and making a one-time load of $25 or more via a bank account, debit card, credit card, or MoneyPak. Once you sign up for a Serve account, you have until September 30th to complete a qualifying load from your funding source, and a credit to your Serve account will appear within 30 days after you add funds to your account. Even when you think this couldn’t be any better, we will be holding a giveaway soon for a very lucky fan to win a Serve Card loaded with $250! Giveaway coming soon! Oh boy!! I can’t hardly wait! !